Are you looking for a climbing bomb to help you improve your climbing strength, stamina, and endurance? How about a quality product that will challenge you, inspire you to train harder, and take your workouts to the next level? Look no further - Atomik's sets of 2 vertical pipe bombs are great beginner - advanced level training tools meant to build pinch strength. - The 2 inches allow the entire hand to engage, making them easier than the 2.75" and 3.5" vertical pipe bombs. - The 2.75 inches force the hand into a more open-handed pinch, making them a semi-rigorous training tool. - The 3.5 inches force the hand into an open-hand pinch, making them very challenging. They are designed to develop superior pinch strength and can be used in a variety workouts. Not completely satisfied? All of our products have our 30-day return policy. Experience your new vertical pipe bombs risk-free. If you are looking to take your pinch strength training to the next level, these pipe bombs will help you get there. Grab yours today. 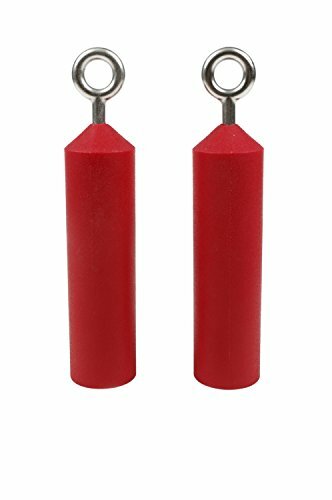 TRAINING FOR ALL LEVELS - Atomik's sets of 2 vertical pipe bombs are great training tools meant to develop pinch strength at any level. With 3 sizes available, you are bound to find one that fits your current skill level. CAREFULLY DESIGNED - The cylindrical shape forces the hand into a more open-handed pinch. The 2" is great for beginners, the 3.75" is perfect for intermediate, and the 4.5" is sure to add an advanced level challenge to your workout. VERSATILITY - These pipe bombs can be used in a variety of different style workouts. Perfect for Ninja Warrior, parkour, gymnastic, bouldering, and rock climbing athletes. Allows full shoulder rotation. SIMPLE TO USE - An excellent addition to your workout routine. Your pinch strength training will be taken to a whole new level. Easy to setup and use, and it's insanely fun to be on. 30-DAY RETURN POLICY - all of our products have our 30-day return policy. This means you can experience your 2 missiles training bombs completely risk-free. Rocky Mountain Climbing Holds. 10 Screw on Foot Jibs.